Welcome to Wired, Drake Music Northern Ireland’s longest running programme. Fueled by the regular attendance of some of Northern Ireland’s most enthusiastic music makers, and by the large and varied selection of top jobbing musicians who have worked for Drake Music over the years, DMPNI have been never so prolific as it has been with the composers who have met in Belfast every Friday for about 20 years. Just in case you are wondering about the James Bond trailer project, here is a link. The musicans involved were Philip Calvert, Tim Leatham, Mary-Louise McCord, and Vincent Smith. Forthe last 6 weeks Wired have been operating out of the Crescent Arts Centre. 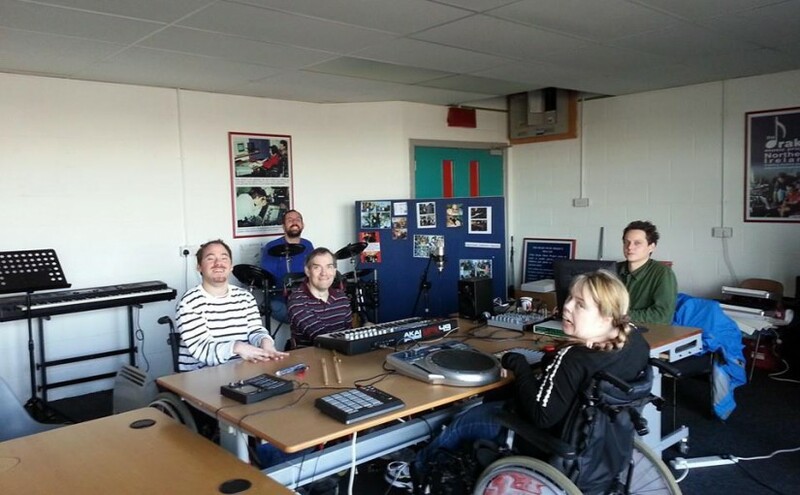 The group are looking forward to moving back to a new studio where all their favourite music making toys will be close at hand. The group are open to inquiries about participation in Wired. If you are the type of person who wishes to compose a wide and eclectic range of music, get in touch. If you are inspired by the idea that you could foster a long term development of your skills as a composer and musician, get in touch with DMPNI, and lets chat.